As the August 1 non-waiver trade deadline looms for teams around Major League Baseball, the Phillies have had their phones ringing constantly for players such as Jeremy Hellickson and Jeanmar Gomez. However, as time passes, Vince Velasquez has popped up on the radar of one team in particular: the Texas Rangers. According to a tweet by FOX Sports' Ken Rosenthal, the "Rangers are 'all over' Vince Velasquez." The notion that Velasquez could possibly become a Ranger has been spreading the past couple days, but it all sounded like an unlikely rumor. How could the Phillies pass up on a future ace in their young rotation? Sources: #Rangers “all over” #Phillies’ Velasquez, scouting him and doing extensive background work. Deal unlikely, however. In Sports Talk Philly writer Brandon Apter's article on Monday, he mentioned that preliminary remarks by the Rangers were made about their interest in the 24-year-old pitcher, but the price would obviously be high from the Phillies standpoint. When the Phillies told the Marlins that in order for them to trade for Hellickson, Miami would have to offer up a top-five prospect in their organization. It's almost certain that they would ask the same of Texas, adding the fact that Velasquez is obviously a much bigger asset to the future of the team. Further noted, the Phillies sent a scout to the Rangers-Yankees matchup on June 28 to look at possible players on the Texas side, as stated in Tim Kelly's article Thursday night. While this sounded like they would be looking at prospects in exchange for Hellickson and Gomez, it almost makes people wonder if the Phillies would be keeping prospects such as Joey Gallo, Lewis Brinson, Nomar Mazara, and even second-baseman Jurickson Profar in mind if they were asked about Velasquez. According to Rosenthal, a deal seems unlikely at current time, but if the price is right, and the Rangers do in fact continue to research Velasquez, a possible trade during the waiver period after the deadline might not be out of the question. Time will tell, but it already seems like the Phillies will have their work cut out for them over the next three days. It is two days away from the Major League Baseball trade deadline and Phillies trade chip Jeremy Hellickson could bring the team a bigger haul than just a top-5 prospect after this morning's deal between the Padres and Marlins. Sign that the trade market has officially gotten out of hand: Jeremy Hellickson may well fetch at least three, and perhaps four, prospects. On Wednesday, ESPN's Jayson Stark said that the Phillies are demanding a top-5 prospect in a deal for Hellickson. If Matt Klentak plays his cards right though, he could bring a bigger return if a trade made this morning is any indication on how the league values starting pitchers. San Diego sent starters Andrew Cashner and Colin Rea plus reliever Tayron Guerrero to Miami for top first base prospect Josh Naylor, righty Jarred Cosart, minor league right-hander Luis Castillo and injured reliever Carter Capps. Cashner is 4-7 with a 4.76 ERA and Rea is 5-5 with a 4.98 ERA this season, so Hellickson's value could be potentially much larger now with the Marlins parting with a top prospect among other pieces to acquire two mid-tier starters. With Miami now out 0f the running for Hellickson, other teams to keep an eye on are the Blue Jays, Orioles and Giants. Hellickson, 29, has made 21 starts, posting a 7-7 record with a 3.65 ERA, 107 strikeouts and a 1.12 WHIP. He will become a free agent following the 2016 season. He is scheduled to make his next start on Saturday in Atlanta. It's just four days away from the Major League Baseball non-waiver trade deadline and the Philadelphia Phillies are standing pat in their talks with regard to right-hander Jeremy Hellickson, asking for a top prospect to complete a deal. Although Stark mentions that the Phillies seem to have no issues keeping Hellickson if they don't get a top prospect, ESPN's Jerry Crasnick said on Tuesday that Hellickson was a "virtual lock" to be traded before the deadline. The Miami Marlins have been the team mentioned most in Hellickson trade rumors. Their top five prospects consist of RHP Tyler Kolek, 1B Josh Naylor, LHP Jarlin Garcia, OF Stone Garrett and RHP Kendry Flores. A first base prospect could prove valuable for a position that isn't decided for the future. 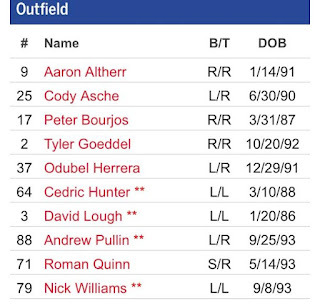 Rhys Hoskins is the lone first base prospect in the Phillies system of note. Hellickson, 29, has made 21 starts, posting a 7-7 record with a 3.65 ERA, 107 strikeouts and a 1.12 WHIP. He will become a free agent following the 2016 season. With the Major League Baseball trade deadline inching closer, Philadelphia Phillies pitcher Jeremy Hellickson seems to be the main trade chip in addition to guys like Peter Bourjos, Jeanmar Gomez and perhaps even David Hernandez. One name that hasn't been mentioned is Vince Velasquez. Although a deal would seem unlikely, the Texas Rangers have interest in the Phillies starter. Philadelphia acquired Velasquez as a part of the deal that sent closer Ken Giles to the Houston Astros. Despite a sore bicep issue in June, Velasquez has remained healthy as a member of the Phillies rotation and has shown that he can pile up strikeouts as well. There have been some growing pains with the 24-year-old right-hander, but he has proven to be a potential rotation piece moving forward. Velasquez is 8-2 with a 3.34 ERA. He's allowed two runs or less in four of his five starts since returning from the disabled list on June 27. The price for a Velasquez trade would be steep for the Rangers, who already dealt the Phillies a handful of top prospects in the Cole Hamels deal last July. Joey Gallo is the Rangers top prospect followed by outfielder Lewis Brinson, right-handers Dillon Tate and Luis Ortiz along with outfielder Jairo Beras to round out their top five. The Phillies would more than likely demand at least one top-5 prospect and then a top-10 to go along with a lower level prospect and perhaps a big league asset. The non-waiver trade deadline falls on August 1 this season. After he hit just .211 with two home runs in 2015, if the Philadelphia Phillies had the option to not bring back Carlos Ruiz for 2016 without a penalty, they probably would have taken that option. Of course, such an option didn't exist, so the Phillies brought Ruiz back for what many expected to be a farewell tour of sorts in 2016, and instead have gotten enough production from the 37-year-old to garner summer trade speculation. Ruiz is hitting .291 after Friday night's win over the Cincinnati Reds, with one National League scout suggesting to Nick Cafardo of the Boston Globe that Ruiz could be a secondary option on the catching trade market later this summer. The Phillies got some really bad news yesterday- Aaron Altherr is out four to six months with a wrist injury. He's having surgery today in Philadelphia, and his season is in jeopardy. Best case scenario, he's back in July. Worst case? 2017. This is a real shame, as Altherr showed potential 20 home run power and a plus glove in the outfield. He had a chance, if everything broke right for him, to be a 4-WAR type of player. The Phillies would have been thrilled with that. That would have helped them be better than a 63-99 team this year, and in the future. The obvious initial impact is in the starting line-up. The presumption of many was that Altherr and Odubel Herrera were set to start in right and center-field, respectively. Then the assumption was that Cody Asche and Peter Bourjos were somewhat locked in a battle for the left field job. Tyler Goeddel, the Rule 5 pick from this Winter, was projected as the fifth and final outfielder, and really the 25th man on the roster. Now, Goeddel is projected to get a lot more starts, and Bourjos and Asche are likely to both get regular starts. Right now at least, that's where the Phillies roster is. You can bet against Pullin, Lough, and Hunter making the team, most likely, and you can put Quinn and Williams in AAA, most likely. This leaves the Phillies with one more spot to fill. As is, the biggest beneficiary of this roster opening seems to be Darnell Sweeney. The young utility man seemed destined to be AAA Lehigh Valley's second baseman to start the season, but this opening makes him look like a good option. He can provide versatility in the field, playing second base (and possibly more) in the infield, and providing a corner outfield option off the bench. He provides the Phillies with a second Andres Blanco type off the bench to use wherever he's needed. Even though both he and Darin Ruf are only marginally outfielders, they provide enough depth on the roster to fill in if needed out there. The other possibility is that this team will still go outside of the organization yet. Cubs outfielder Matt Szczur has local ties (he attended Villanova) and is out of options if he doesn't make their team. The Phillies will certainly look at more than one option here, and could look on the free agency market yet too. They aren't likely to just settle for the "next guy up" to fill in here. If I had to bet right now, I would put the smart money on Sweeney, followed by someone not on the roster right now, Williams or Quinn, and Hunter finally. Clearly though, the Phillies have their first major injury issue of the Spring. One thing to consider here- the Phillies have the roster spots of Matt Harrison and Aaron Altherr that they can use, if they put both on the 60-Day DL. In other words, their options aren't limited by space. New general manager Matt Klentak has made his first offical trade as a member of the Phillies front office. According to CSNPhilly.com's Jim Salisbury, the Phillies were in talks with Arizona to acquire 28-year-old right hander, Jeremy Hellickson. Now, the deal is official, with minor leaguer Sam McWilliams heading to Arizona in the swap. #Dbacks will receive Sam McWilliams 20-year-old RHP from the #Phillies in exchange for Jeremy Hellickson. Selected by the Rays in the 4th round of the 2005 draft, Hellickson was dealt to Arizona last offseason on this date in exchange for two minor leaguers. In 2015, he went 9-12 with a 4.62 ERA in 27 starts for the Diamondbacks. In 2014, his ERA was just ten points lower at 4.52 and in 2013, it was over five, so Hellickson hasn't had a ton off success recently. In 2011 though, he won the AL Rookie of the Year award after posting a record of 13-10 to go along with an ERA of 2.95. He could very well be an inning eating starting pitcher for the Phillies rotation following the departures of Aaron Harang, Chad Billingsley and Jerome Williams. Hellickson has never pitched against the Phillies at Citizens Bank Park, but he did hit Maikel Franco with the pitch that broke his wrist this season. Heading to the Diamondbacks is 6-foot-7, 20-year-old right-hander Sam McWilliams. Drafted in the eighth round of the 2014 draft, McWilliams has gone 2-5 with a 4.19 ERA in two seasons, spanning 16 games, with the Gulf Coast League Phillies. On Wednesday afternoon, the Phillies and Dodgers agreed on a trade to second long-time Phils second baseman Chase Utley to LA in exchange for a pair of prospects. Though the deal is not official yet, one of the prospects in the trade is known. Hearing one prospect headed to Phillies in Utley deal is Triple-A INF/OF Darnell Sweeney. 13th in LA system, according to MLBPipeline. 24-year-old Darnell Sweeney comes to the Phillies as the first player in the deal. Drafted in the 13th round of the 2012 draft by the Dodgers, the infielder/outfielder ranked as the 13th best prospect in the Dodgers organization according to MLB Pipeline. Sweeney is a switch-hitter and averages .270 against right-handers and .272 against lefties. Overall this season with Triple-A Oklahoma City, he's hitting .271 this year with 30 doubles, four triples, nine home runs, 49 RBI's and 69 runs scored. His plate discipline leaves something to be desired, with 116 strikeouts and just 42 walks, but he does have 32 steals. Last season in Double-A ball, Sweeney hit .288 with 14 home runs and 57 RBI's. Update (3:23pm): More news has developed on the Chase Utley front, with a west coast team emerging as the front-runner. That being said, it is rumored that Utley will remain in Philadelphia if a deal isn't reached today. If a deal is struck, it seems most likely to be for a mid-level prospect or two. Sources: #Dodgers indeed front-runner for Utley, as first reported by @ToddZolecki. Any deal will be pending a review of medicals. Sources: #Phillies, #Dodgers talking about Utley for two minor leaguers, with LAD assuming ~$2M of Utley’s remaining ~$6M obligation. Original story: On Tuesday, both general manager Ruben Amaro and interim president Pat Gillick expressed to the media that it was likely Chase Utley remains in a Phillies uniform through the rest of the season. It seems that has changed in just a days time. Fox Sports' Ken Rosenthal reports that the Phillies could trade Chase Utley as soon as today. Sources: Utley situation with #Phillies coming to head. Trade possible today. Chase has come off the disabled list looking like he has something to prove. He's hitting .484 (15-for-31) with five doubles, a homer, five RBI's and five runs scored. In his 31 at-bats, he's only struck out three times. The Angels, Giants, Cubs and a few other teams have shown interest in the long-time Phillies second baseman, but Utley has said that he'd prefer to be sent to a team on the West Coast, likely near his home in San Francisco.